On Thursday, February 5th, this great patriot passed away, just four days shy of his 92nd birthday. It was also less than a month after the following column of his appeared in the Houston Chronicle on January 9, 2004 (it subsequently has disappeared, despite its obvious importance--more about that at the bottom of this page). We posted the column as a Latest News and Analysis feature on January 15th (the Chronicle link will be changed to this page), but felt that Admiral Moore's comments are of such great importance that they deserve to be preserved in the form of a Featured Story, to be more readily seen near the top of our homepage and so the title will later be prominently displayed in our archives. After his column, we have assembled numerous links concerning the USS Liberty and Admiral Moorer. This page is meant to serve in some small way as a memorial to them both. "I've never seen a President -- I don't care who he is -- stand up to [Israel] ... They always get what they want. The Israelis know what is going on all the time. I got to the point where I wouldn't write anything down. If the American people understood what a grip these people have got on our government, they would rise up in arms." After State Department officials and historians assembled in Washington, D.C., last week to discuss the 1967 war in the Middle East, I am compelled to speak out about one of U.S. history's most shocking cover-ups. On June 8, 1967, Israel attacked our proud naval ship -- the USS Liberty --killing 34 American servicemen and wounding 172. Those men were then betrayed and left to die by our own government. U.S. military rescue aircraft were recalled, not once, but twice, through direct intervention by the Johnson administration. 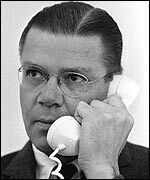 Secretary of Defense Robert McNamara's (photo, right) cancellation of the Navy's attempt to rescue the Liberty, which I personally confirmed from the commanders of the aircraft carriers America and Saratoga, was the most disgraceful act I witnessed in my entire military career. To add insult to injury, Congress, to this day, has failed to hold formal hearings on Israel's attack on this American ship. No official investigation of Israel's attack has ever permitted the testimony of the surviving crew members. A 1967 investigation by the Navy, upon which all other reports are based, has now been fully discredited as a cover-up by its senior attorney. Capt. Ward Boston, in a sworn affidavit, recently revealed that the court was ordered by the White House to cover up the incident and find that Israel's attack was "a case of mistaken identity." Israeli reconnaissance aircraft closely studied the Liberty during an eight-hour period prior to the attack, one flying within 200 feet of the ship. Weather reports confirm the day was clear with unlimited visibility. 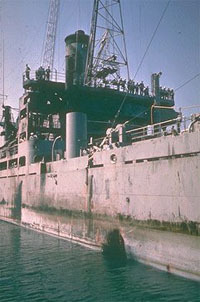 The Liberty was a clearly marked American ship in international waters, flying an American flag and carrying large U.S. Navy hull letters and numbers on its bow. Despite claims by Israeli intelligence that they confused the Liberty with a small Egyptian transport, the Liberty was conspicuously different from any vessel in the Egyptian navy. It was the most sophisticated intelligence ship in the world in 1967. With its massive radio antennae , including a large satellite dish, it looked like a large lobster and was one of the most easily identifiable ships afloat. Israel attempted to prevent the Liberty's radio operators from sending a call for help by jamming American emergency radio channels. 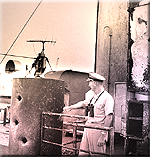 Israeli torpedo boats machine-gunned lifeboats at close range that had been lowered to rescue the most seriously wounded. There is compelling evidence that Israel's attack was a deliberate attempt to destroy an American ship and kill her entire crew. 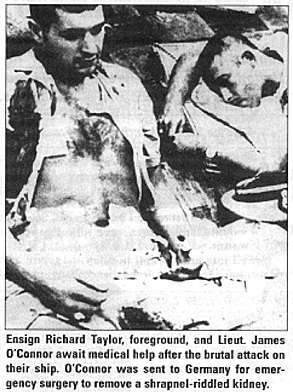 In attacking the USS Liberty, Israel committed acts of murder against U.S. servicemen and an act of war against the United States. The White House knowingly covered up the facts of this attack from the American people. The truth continues to be concealed to the present day in what can only be termed a national disgrace. What was Israel's motive in launching this attack? Congress must address this question with full cooperation from the National Security Agency, the Central Intelligence Agency and the military intelligence services. The men of the USS Liberty represented the United States. They were attacked for two hours, causing 70 percent of American casualties, and the eventual loss of our best intelligence ship. These sailors and Marines were entitled to our best defense. We gave them no defense. Did our government put Israel's interests ahead of our own? If so, why? Does our government continue to subordinate American interests to Israeli interests? These are important questions that should be investigated by an independent, fully empowered commission of the American government. The American people deserve to know the truth about this attack. We must finally shed some light on one of the blackest pages in American naval history. It is a duty we owe not only to the brave men of the USS Liberty, but to every man and woman who is asked to wear the uniform of the United States. Admiral Moorer was joined in the independent commission of inquiry by Gen. Ray Davis (recently deceased); Rear Adm. Merlin Staring; former Judge Advocate General of the Navy and Ambassador James Akins. USS Liberty: Did Israel commit one war crime to hide another? Real News 24/7: Admiral Moorer's comments were originally published in the Houston Chronicle, 9 Jan 2004 as "Betrayal behind Israeli attack on U.S. ship." The title used above comes from a Lebanese publication, The Daily Star. Curiously (or, perhaps, not curiously), the column's Chronicle link—http://www.chron.com/cs/CDA/story.hts/editorial/outlook/2345393—is now dead, despite having gone up only a month ago. It is not even found in the archive or as a link appended to his obituary, but has been pitched into the Chronicle's memory hole (as in information black hole). Did the powers-that-be at the Chronicle decide that this was too hot to retain or were they forced to get rid of it by its parent company, the Hearst Corporation? And what part did the government and the pro-Israeli lobby have in its banishment? Whatever the answers to these questions, important as they are, the fact remains the same no matter that the same shameful act deprives Americans of access to an important opinion they're unlikely to find elsewhere. Fortunately, though, some websites were able to save this before it vanished forever. We have posted it both as a tribute to the memory of a true American hero and as an important document in the fight to restore America's sovereignty.